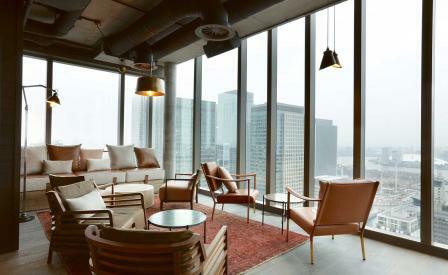 Bokan, the new sky-level restaurant and bar at the Canary Wharf Novotel, is a sharp lesson in not paying heed to first impressions. If you can get beyond the hotel’s location on a soulless, crane-heavy sweep of Canary Wharf and the lift potentially lifted from a 1980s office block, you’re on to a winner – because, even if there were nothing else, there is ’that view’. Set over three levels on the 37–-39th floors (making it higher than any restaurant at The Shard), the space, unsurprisingly, offers up jaw-dropping views across London from just about every angle (including the toilets). Quite frankly, cheese on toast would have been a satisfactory accompaniment to this, but the fare is considerably more sophisticated. The restaurant’s kitchen is headed up by Aurelie Altemaire, the talented former head chef at the Michelin-starred L’Atelier de Joel Robuchon, and among the dusts and glazes and crisps and coulis, there are some nicely executed modern European dishes peppered with Asian influences – think grass-fed lamb cutlets with charred aubergine and chimichurri and whole lobster with green mango salad and jasmine sauce. Cocktails, meanwhile, are whipped up by Danilo Tersigni (previously of Mayfair gin parlour Mr Fogg’s). Referencing the hotel’s dockside location and its history as a trading hub, offerings come with monikers like Blackwall Frigate, Bowsprit and East Indiaman and ingredients such as rum, brandy, tea, fruit and spices. Perfect for enjoying on the all-weather roof terrace.